There are several versions of the Fanfare album: the 1990 original, the re-issue, the LP, the test print and the bootlegs. We are going to deal here with the official versions. If you want to know more about the bootlegs, please have a look here. The album was originally released by Setanta in 1990 and issued to less than 200 copies. According to Neil Hannon, this was the reason why it has been deleted even before the release of Liberation . The same typeface is to be found on the back of the insert and on the back cover but not on the CD. 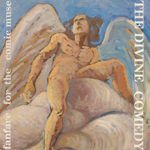 On the CD, the name ‘THE DIVINE COMEDY’ has the same typeface as on the front cover but we can spot a small misprint at the E of DIVINE on the CD. The insert and the back cover both spell ‘John McCulagh’ instead of ‘John McCullagh’. Despite the fact that Fanfare was no longer recognised by Neil Hannon , Setanta reprinted the album in late 1998. Many copies have been sold for a regular price, but they’re now overrated since the album has always kept its deleted status in people’s mind. The front cover and the back are the same as on the first edition. The difference of the back of the insert is that is written ‘John McCarthy’ instead of ‘John McCulagh’. On the CD, a standard font was used for tracklisting and info. 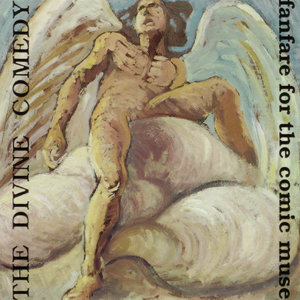 And a different typeface was used for the names ‘THE DIVINE COMEDY’ and ‘fanfare for the comic muse’. On the CD we can read ‘ALL TITELS’ instead of ‘ALL TITLES’. All these differences were confirmed by Setanta, who said that the spelling mistakes and name changes were due to the person who did (or re-did) the artwork. 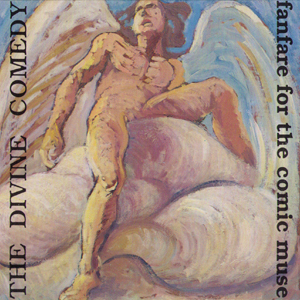 On this edition, the ‘THE DIVINE COMEDY’ and ‘fanfare for the comic muse’ texts are written in white (instead of black on the original CD) and the positions are inverted: ‘THE DIVINE COMEDY’ is on the right; ‘fanfare for the comic muse’ is on the left. The painting on the cover is framed higher and the right foot (on the left) is missing. On the back and on the spin of the cover, the text is in white on a blue background. There are no spelling mistakes: we can read ‘John McCullagh’ (with a double L). On side A the label features Setanta’s Caoilfhionn Label (named after Keith Cullen’s daughter) which appeared as a default label on a few Setanta Records’ releases Into Paradise’s Under The Water. The design is actually taken from the Book of Kells . 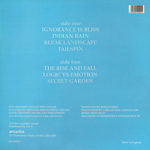 The B-side’s label features titles and copyright information over a background where are printed the usual LP information with different font sizes (1990 SET LP2 SIDE TWO 33). Some collectors own signed version of the LP by the band members of that time. This must be quite valuable knowing the fact that the band split up in 1992. The test-print of Fanfare is said to exist only in 5 copies. There were made by Mayking Records, and the labels features the stamped date of 28th June 1990 in French. The reason of it being in French is actually because Mayking Records is part of MPO, French pressing plant. The label also has the catalogue number ‘SETLPM2’ filled in biro. Some of the copies – but not all – also features the tracklisting and copyright notes handwritten on the labels.